About the Webinar: According to research by the Cognizant Centre for the Future of Work, when it comes to preparing people for jobs in the future of work, both corporates and higher educational institutes are slow to revamp their education and training models or collaborate with each other. Research by the KNOLSKAPE Insights Centre shows that learning mode is on the cusp of disruption, and how we learn tomorrow will be markedly different from how we do so today. 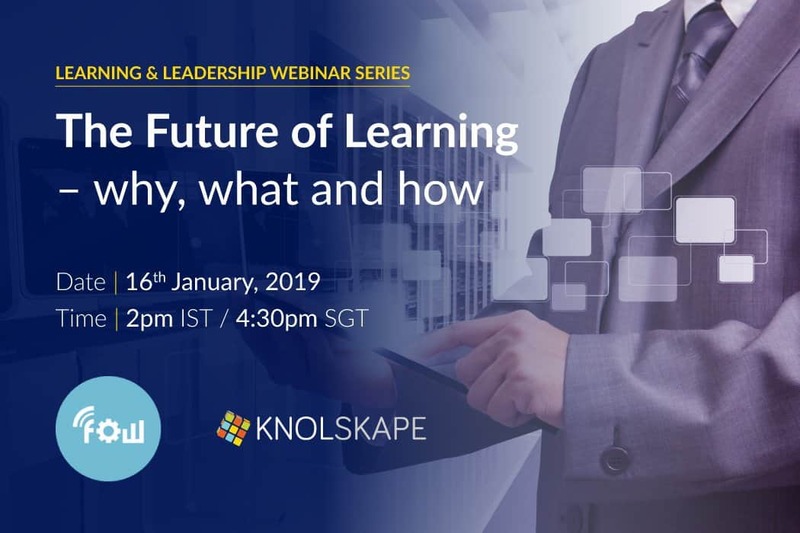 In this exclusive webinar, Manish and Rajiv unravel the why, what and how of the future of learning, and discuss the many possibilities that organizations can look forward to, given the disruption in learning methods. Manish Bahl, Head - APAC, Centre for the Future of Work, Cognizant; Rajiv Jayaraman, Founder and CEO, KNOLSKAPE. Manish Bahl heads the Center for the Future of Work (cFOW) in Asia Pacific and is responsible to develop original thought leadership content related to Code Halos, Digital Transformation, and the Future of Work. Rajiv Jayaraman is the Founder CEO at KNOLSKAPE and is the author of the upcoming book Clearing the Digital BLUR.